A mid-century guide to hand sewing for children, delightfully illustrated. 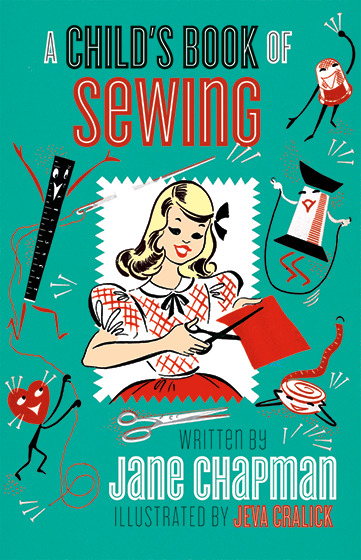 A Child's Book of Sewing, a reproduction of an extremely useful and charming mid-century instructional sewing book for children by Jane Chapman, features illustrations and diagrams (by Walter Chapman and Jeva Cralick) that are not only delightful, but also practical. The creators of this book realized that machines easily intimidate beginning sewers, and limited their scope to hand sewing. It includes a handful of simple projects that children eight and up can accomplish with little to no adult supervision, including a bookmark, beanbag and change purse.' A Child's Book of Sewing also includes instructions and diagrams on basic hand stitches, using needles, scissors, thimbles and pins, basic pattern use and more. About a yard of felt and a few simple notions are all the beginning sewist needs to complete all the projects in this book.